For more information contact Dan and Ellie Millar. Wednesday night is a night dedicated to athletics at The Salvation Army Meadowlands. We are currently featuring pick up Volleyball. A core group of people, some from our church and many from the community, some accomplished volleyball players and some not so accomplished meet each week at 7:30 to pick teams, play some volleyball and enjoy each other’s company. New players both male and female are always welcome. The volley ball has also been augmented at times by other activities that do not require the gym like walking aerobics, tai chi and a running club. If you want more information about Volleyball or have an idea for another activity that could be offered on a Wednesday please feel free to contact Dan and Ellie Millar (dan_millar@can.salvationarmy.org) or the church office. With this in mind, our programming is based on the following four-fold aims: worship, education, service and fellowship. Our programme varies from week to week. We have special speakers, raise money for special projects, collect items to give to women’s homes and hostels in the Hamilton area, etc. 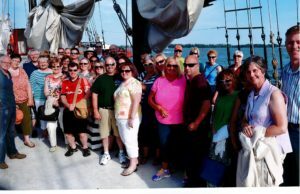 We enjoy our annual trip in June to places in the surrounding area. It is a time of fun and fellowship. 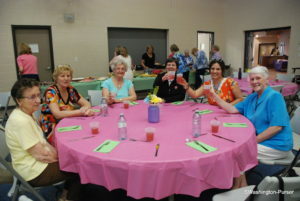 We meet on Tuesdays 1:30 p.m. to 3:00 p.m from September to June. If you would like any more information, please call 905-304-0602. LMNO (Ladies of Meadowlands Night Out) is a group of ladies of all ages who enjoy a night out together enjoying a variety of activities, food and fellowship. We meet on the 4th Wednesday of September, November, December, January and May at the Church (unless otherwise notified). Cost is $5 per night ( except for November). As well as supporting our events, funds raised are used to support the Salvation Army Overseas Missions and local Salvation Army Ministry Units. For more information contact Ellie Millar. 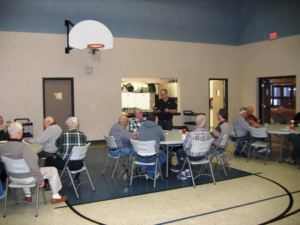 The men’s fellowship group is open to all men regardless of age. Some men have brought their teen age sons. The group meets for breakfast the second Saturday of every month at 8:30. There is a small fee of $5 which includes a breakfast of bacon, sausage, scrambled eggs, pancakes, tea, coffee and orange juice. Special dietary needs can be accommodated. Men start to gather any time after 8 and fellowship is enjoyed over coffee/tea before breakfast and then around the tables during breakfast. Every meeting is concluded with a brief devotion related to men’s place in the home, church, neighborhood, workplace etc. Quilting Classes (Meadowlands in Stitches) resume Friday, September 7th and continue through to July. 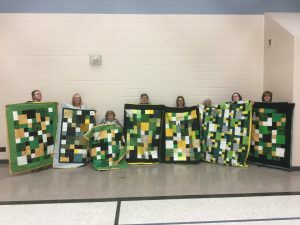 Time: 9:00 a.m. to around 12:00 p.m.
We made and donated quilts to ‘Quilts for Humboldt’, we have previously donated 42 Christmas stockings to the Alzheimer’s group in 2017 and are now working on stroller/baby quilts for Grace Haven. New ladies welcome! Phone 905-304-0602 for more information. The Women’s Bible Study group is open to women of all ages. We meet to encourage each other and to get a better understanding of the Bible, praying that the Lord will direct us in applying it to our lives. Come join us on Fridays at 1:30 from September to June. For more information call 905.304.0602 between 9 and 2 Monday to Friday or worship with us any Sunday at 11:00.